Welcome to the Whole Health Network Store! Designed and based on decades of research conducted by Manfred Von Ardenne on what is known as Oxygen Multi Step Therapy (OMST), our LiveO2 and LiveO2 AC systems are used in the offices of leading Cardiologists, world renowned Oxidative physicians, and esteemed Naturopathic physicians and alternative practitioners alike, all to achieve the unprecedented results with their patients that LiveO2 has become known for delivering. 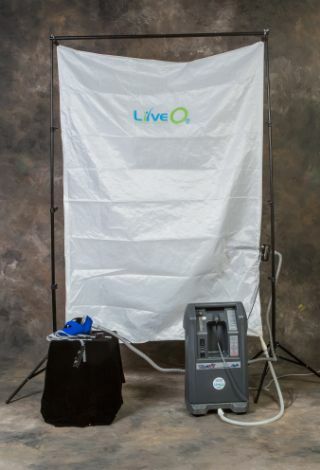 Surpassing conventional HBOT (Hyperbaric Oxygen Therapy) by giving the user the opportunity to gain cumulative results more quickly through repeated use, LiveO2< can be used daily -- right in your own home! There is a widely accepted school of thought that reoxygenation of the body may be the hidden key to healing and sustained health, cellular energy, immune support and detoxification. It is thought that by reoxygenating the body, homeostatic balance may be restored. The products and the claims made on or through any website, emails, publications, or advertisements have not been evaluated by the United States Food and Drug Administration and are not approved to diagnose, treat, cure or prevent disease. The information presented is designed for educational purposes only. It is not intended to be a substitute for advice from your physician or other health care professional. You should not use any of the information for diagnosis or treatment of any health problem. You should not stop taking any medication without first consulting your physician. Consult a physician before using this product if you have any medical condition whatsoever, or if you have or suspect you might have a health problem, or if you are pregnant, or if taking any kind of medication. In accordance with FDA regulation, we do not make any therapeutic claims regarding the health benefits of any products. Results vary with every individual, and your results may or may not be different from those depicted. No promises, guarantees or warranties, whether stated or implied, have been made that you will produce any specific result as a result of purchasing our products or using information from our website/email. Whole Health Network, LLC, its owners, employees, re-sellers, and associates disclaim any liability, loss, or risk incurred, directly or indirectly, as a result of the use and application of the contents or products or in our shipping contents. If you are unwilling to be bound by this disclaimer, you should return this product for a full refund immediately. Information may contain technical inaccuracies or typographical errors. Information may be changed or updated without notice.